Performance at San Francisco's Chinese Culture Center! 750 Kearny St. 3rd Floor. 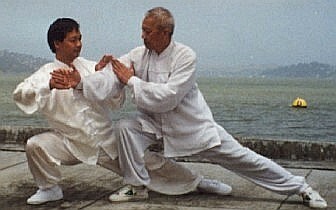 Tony Wong (in Chinese: Wong Wai Yi) and Grandmaster Chen Qingzhou demonstrating push hands. Friday, March 30, 2001: 5:00 p.m. - 8:00 p.m.
7:00 - 7:30 p.m. : Question and answer period. Beginning in April 2001: A Chen Family Taiji Class will be offered at the Chinese Culture Center. Click for more information.